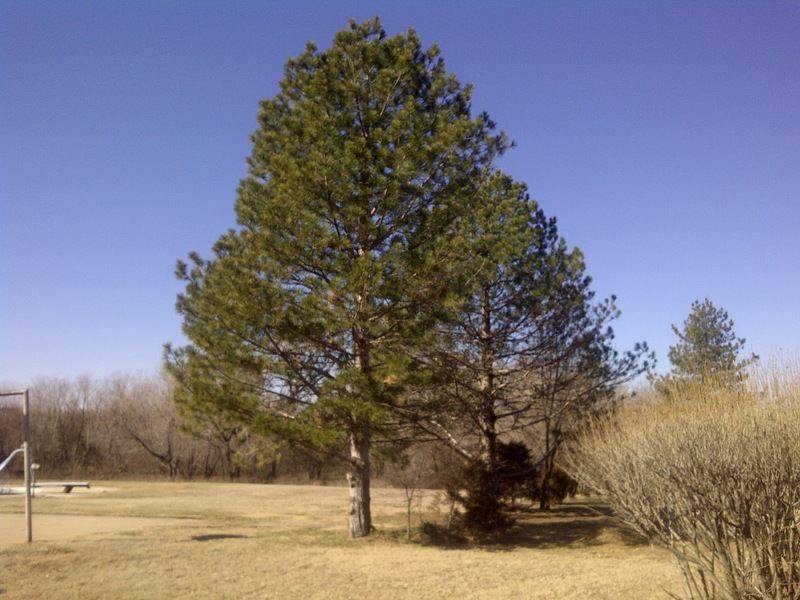 Lessons From the Destroyed Pine – He Said What?! The autumn day was beautiful. Sunshine abounded, warm temperatures cheered our spirits, birds were singing, and our home was full of activity as we prepared for Thanksgiving. Andrew was home from college and was busy helping Gary haul off our old dining room set and then do some work on the trucks. We were carrying in groceries that would be used in a couple days to prepare our Thanksgiving dinner, all the while dodging our big Great Dane who was happily moving from one to the other of us as he enjoyed all the excitement and bustle. It was the kind of day I love – a day of togetherness, of accomplishing tasks, of anticipation of having the family together for Thanksgiving. Yet in the background were other noises – sounds that we couldn’t drown out, even in the midst of our joy and activity. There was the grinding sound of the chain saw, the shout of the tree cutter, and the unmistakable thud of a dead branch hitting the ground. When my eyes left the scene of happiness in our front yard and wandered to our side yard, I couldn’t ignore the scene that was being played out there. It was a scene of death; of destruction; of ending. This was the second visit that our tree cutters had made to our home to take away not one, but now two of our beautiful pine trees that had succumbed to the deadly nematodes of Pine Wilt disease. 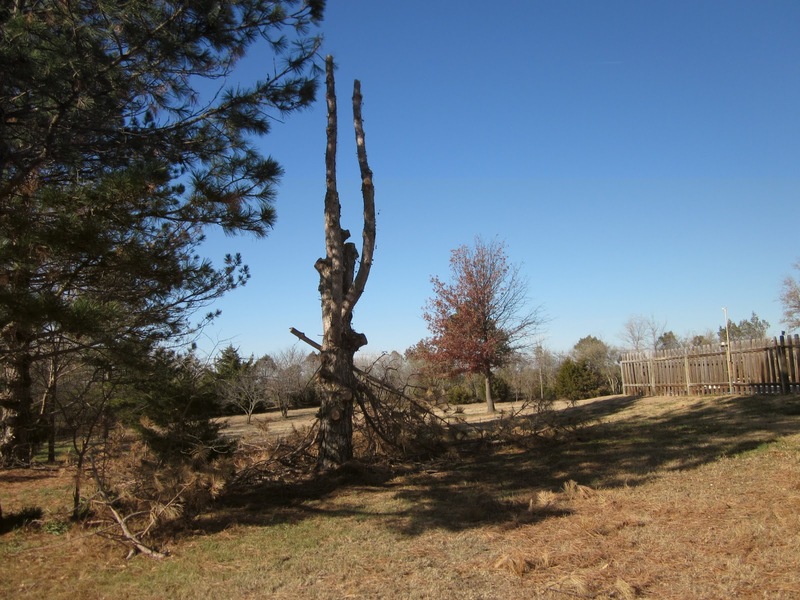 The first dead tree further down on our property had been cut down and carted off several days earlier. This second tree that was being cut on this gorgeous day was right outside our back door, just off the patio area. 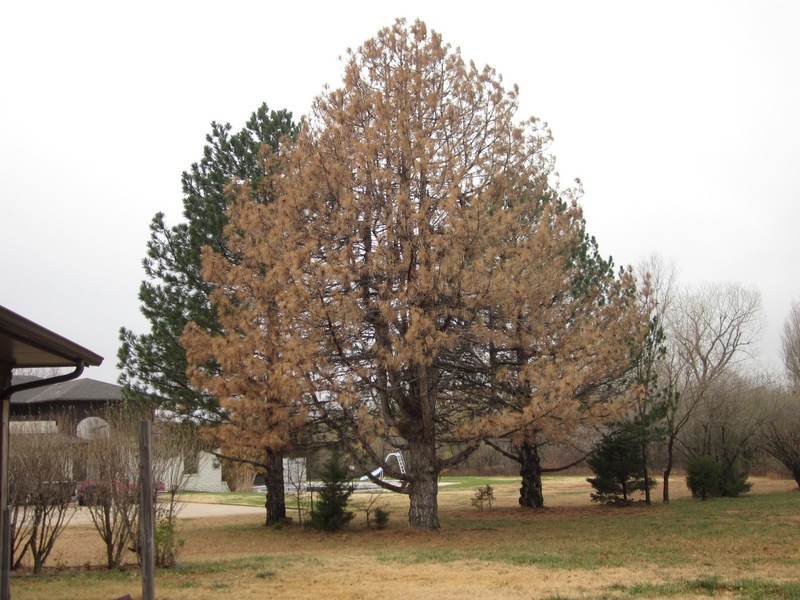 Our large, perfectly shaped pine tree had been destroyed by the unseen, hidden little nematodes that had eaten away at the very heart and life of the tree. The two young men worked diligently at their task. Starting at the top of the tree, Jordan used his chain saw to cut each section and branch down. His co-worker on the ground would then carefully stack these portions onto the truck to be carried away. Then they would return to repeat the process until finally the entire tree was disposed of and hauled away. I walked outside at one point while they were gone and just observed the sad display of this once magnificent tree. There it was, stark against the pretty blue sky – a dark, bare, useless trunk. What a picture of loss! This once productive tree was now only a memory of its former glory and usefulness. Those horrible little nematodes had, unknowingly to us, been eating away at our beautiful tree and had finally accomplished their purpose. Our tree was fit for only one thing – to be cut down and taken away, never to be of any use again. How interesting that this once sturdy tree had stood strong against the outward, visible attacks that had come against it during the many years of its life. Fierce winds had whipped its branches; tornadoes had come way too close; snow had piled on its limbs; thick ice had caused some of its branches to snap; drought had tried to deplete it – yet still it stood, proud and strong. What felled our tree was the tiny, unseen nematodes that were working inside its massive trunk and extending into its many branches. These intruders methodically destroyed the inner life of our stately tree until finally we could see the outward evidence of inward death, and had no recourse but to demolish our tree and have it carried away. We all face many storms in our lives that bombard us with stress and grief. At times it’s overwhelming, but I know that for me these fierce storms have driven me to my knees and the Word for guidance and comfort. I have grown even in the pain of these trials. However, what causes me the most damage, it seems, are the hidden sins or hurts that lodge in my heart. No one can even see them or be aware of the damage that they are causing in my spirit. It’s easy for me to hide my attitudes or my pain from those around me, at least for a period of time. Eventually, though, the destruction that my inner destoyers have caused will begin to show outwardly. It becomes more evident, not only to me but to those around me, that I am not the person I used to be. My effectiveness for Christ suffers as I allow my inner attitudes to take away my joy, my peace, my testimony, my service. Perhaps you have allowed some of the sinful nematodes of life to take residence in your heart. You have not been like the Psalmist who declared: “He will be like a tree firmly planted by streams of water, which yields its fruit in its season and its leaf does not wither; and in whatever he does, he prospers.” (Psalm 1:3) You have allowed inner hurts to take root and prosper instead; or perhaps pride; maybe bitterness over situations that you cannot control; lost ministries that you miss; children who embarrass or disappoint…………..the nematode possibilities are endless, but all are devastating. They burrow inside and take away your very life until you are a former shell of what you used to be. Oh, may we instead be like Paul, who said, “…….but one thing I do: forgetting what lies behind and reaching forward to what lies ahead, I press on toward the goal for the prize of the upward call of God in Christ Jesus.” (Philippians 3:13-14). Oh God, purge our hearts from the sin that so easily takes control, and strengthen us to reach forward and press on toward the goal that You have for us! Next Next post: What Species?